Originally posted the following on 2.14.08, back when the blog was all sorts of new. As of late my life has been a series of occurrences right out of The Far Side cartoons and captions in real life, so I thought I'd revisit this post - Hope you dig. 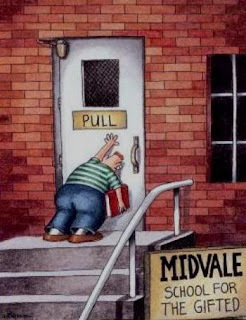 OK - favorite"Far Side" pic ever! The above carton reminds of me of this life of mine. While I'm an excellent dancer when the music is on, I'm a bit clumsy in real life...on occasion. Sometimes the blatantly obvious, is not so very for those of us who are Midvale alum. For instance.....I've actually put my my pump battery in backwards and then wondered why "the damn thing wouldn't work!" I've walked into, and almost through a screen door - with coffee in hand. No damage to the screen, but I ended up wearing my coffee. I've put my test strip in the machine upside down and then wondered where the area was to place my drop of blood. Once, in High School when I was deep in conversation with my 3 best buds, I actually walked smack into Stop sign because I was enthralled over my friends latest escapades, I looked at them instead of looking ahead. I don't know which hurt more, my head or my pride. I used to give my insulin shots through my clothes to save time - andto secretly impress my friends. Of course, only when I was wearing white or some other light color, would a drop of blood decide to appear. Ironically it never once happened when I was wearing black, purple, or blue. We all know about pump tubing and doorknobs. It's a global issue, nuff said. I inadvertently caused myself to fall and ended up at the bottom. We all push when we should pull at times, but we learn and move forward just the same. It's very similar to dealing with our Diabetes. Just when we think we know it all about this disease, it throws us curve ball or two, forcing us to learn yet another set of rules regarding the Big D.
And we do, because we can....And because we must.